We used Greg as our DJ for our wedding, he was so great to work with! He was very organized, very quick responses and made sure everything went smooth. We really appreciate the input that Greg provided for us, he made sure our day was exactly what we wanted. One of the biggest hits at our wedding was the photo booth, our guest still talk about how much fun it was and the best one they have seen! Jen was so sweet and fun with running the photo booth and making us our photo booth book. They brought so much energy into the room, we did not do any family dances or the boutique toss so we had many hours of dancing and people would not get off the floor! Thank you once again Greg & Jen! We recommend NRG Entertainment for any event! NRG Entertainment Provided Amazing DJ Services At Our Fall October Wedding!! My wife and I chose NRG Entertainment to DJ our fall wedding in October. Greg is such a amazing fun spirited guy who provided the most top notch services on our important special day! We both enjoyed working with Greg leading up to our wedding and during our final meet & greet, Greg suggested a fun personal way for introducing our wedding party, which added to making our day that much more fun and special. Greg is all about making sure all your details are covered and his online event planner made it easy for us to add every detail and all our songs. I would highly recommend Greg & NRG Entertainment to anyone who is looking for a professional DJ who takes pride in being organized and most importantly has fun engaging people in having an awesome time at any event that your looking to have DJ'd!! Dance floor was packed all night, everyone loved the music. Highly recommend. My guests danced the night away. All of them! Not just the "young" crowd. DJ Greg of NRG Entertainment Company, LLC kept my guests on the dance floor even though it was SO HOT. We were all sweating like mad but no one wanted to leave. He did an amazing job, and I really appreciated his thoroughness and flexibility (there was a will we or won't we Father Daughter dance due to my dad's health and he handled it like a pro). On top of that, he got TWO demands for encores!!! Literally no one wanted him to stop. If you’re looking for a great dj for your wedding stop right here! Greg is a very professional but fun guy. He was very intuitive on our wants and knew what we wanted before we did. He was very easy to work with and contact was a breeze. He kept the party going for entire night!! We added the photobooth to our wedding and it was a great decision, we even ended up with all the pictures!! Everyone at my wedding had a great time and couldn’t stop raving about it! Would absolutely hire again! Greg can throw a party! Greg was awesome!!!! Despite a very long day for our guests, an extremely humid evening and a jam-packed venue, Greg seriously delivered. Our guests never stopped dancing and the party never seemed to stop! We planned our wedding from a long distance away and took a recommendation for Greg from our planner. 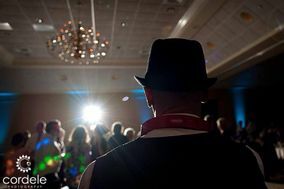 We quickly learned that he was extremely popular in the NH Lakes region, often DJing multiple "generations" of weddings. Knowing that word-of-mouth references are hard to beat, we scheduled a video chat with Greg and hired him immediately after. Greg provided us with a super useful online form to fill out highlighting our "must plays", do-not plays, etc. He also asked tons of thoughtful questions that indicated his extensive experience and attention to detail. We did not need Greg for our ceremony, so we met him quite literally 5 minutes prior to our wedding party introductions and could not have been happier. He did a great job of feeling out the party throughout the night and seamlessly kept up the energy through our preferred list of songs. We wouldn't hesitate at all to hire Greg. The end result was the party of our lives and we can't thank him enough for all his hard work! AMY!! OH my gosh thank you so much for this! I'm so happy to hear you had such a great time! Thank you so much for trusting in me and having me be a part of your big day! DJ Greg was awesome to work with! We chose him as our DJ for our 9/1/18 wedding. He is so helpful along the way during the planning process. His energy is great and he gets the whole room up on the dance floor. Our dance floor was full the entire night!! I am so thankful we chose him as our DJ and would highly recommend him! You will not be disappointed!! DJ Greg and Jen Eaton did our wedding on Friday and we cannot say enough good things about them! They were amazing through the whole planning process and threw a killer party! Greg was great at reading the crowd and keeping the dance floor all night long. Jen was fantastic in the photo booth (I HIGHLY recommend getting the photo booth if it is in your budget- everyone loved it and it's so fun looking at all the pictures after). Their photo booth is one of the best I've seen- excellent props and a great photo machine. Jen had great energy with my guests there, as well! Greg was helpful, responsive, and listened to all our concerns and vision for the big day. He coordinated the events seamlessly on the big day. We actually planned our NH wedding from AZ and their online planning tool and responsiveness made the process so easy and fun. Thank you, Greg and Jen! We absolutely loved working with Greg at NRG for our wedding! From the very beginning he had great energy, was kind and knowledgeable. He provides great tools to help guide you through the day - the general timeline, all of the important songs, overall vibe you are looking to create. With little back and forth needed we were able to communicate a day-of-plan I felt confident and excited about! Our wedding venue required multiple areas for music - ceremony site, cocktail, dinner, dancing but Greg handled it with ease! We received countless complements on the atmosphere he created and how you could tell he was having a good time himself! Greg did an amazing job helping us put together our ceremony and reception, in a short amount of time! He was super responsive to emails/calls and was accommodating to our schedules when we met. The online tool for organizing the music for various parts of the wedding is really user-friendly and convenient. It helped us share with Greg our vision for bringing 2 cultures together, and he went above and beyond to deliver that! Highly recommend!! I was overwhelmed when it came to picking a DJ for our wedding as there were SO many options on the knot and similar websites, but I am 100% sure I picked the right DJ for us with Greg! He was so laid back through the whole process yet right there when I had any questions or needed guidance! On the day of our wedding he was completely prepared and on top of every piece of the music but also as playing the MC. I only gave Greg a few songs that we wanted and let him run with a lot and it was perfect! He had everyone dancing the whole time! I would absolutely recommend him to any bride! DJ Greg brings it all. He is such a great person to have on your team to make your event/ special day come to life. He helped us stay on track with our wedding planning, and helping us when we did know what to do! His personality is so easy to work with and he handles everything with care. Day of our wedding was spectacular! When we ran out of our music list it seamlessly rolled into music that felt like us - we even had a couple people ask for our playlist! As the dancing kicked off DJ Greg kept the party rolling - the evening was wonderful - and DJ Greg was an essential part of that. I would recommend him to anyone that needs a great DJ! DJ Greg was excellent. We hired him for our wedding (The happiest and most stressful day of our life, lol) From beginning to end he was there to answer question and relieve the stress of wedding planning. He isn't just a DJ, he is the MC of the night! His online tool for planning the events of the night took a lot off our plate. If you've never gotten married before there is a lot to do! When it comes to the actual event he is even better! He has so much energy and really knows how to get the party going and keep it going. Our guest loved him and had tons of fun. Then there is Jen, she ran the photo booth. It was a huge hit. Our guests lined up to take photos with a lot of cool props. They all got to keep a copy of the pictures and we got copies too, both physical and digital. I only wish Wedding Wire would allow me to give them more than 5 stars. The compliments I am still getting from our reception is amazing. Everyone loved the music. Greg was super fun and kept the party going. Not one person didn't enjoy themselves. Greg did a knock out job with our reception and we are so beyond thrilled we had such an amazing DJ. We will be recommending him to all of our friends and using him if we ever need another DJ in the future. Thank you so much Greg for adding to the amazing memories. Using NRG Entertainment's DJ and Photo Booth services at our wedding was one of the BEST decisions we made! Both Greg and Jen were wonderful to work with from start to finish. Greg had our guests up and dancing on the dance floor all night! Jen is the queen of Photo Booth and some of our most cherished photos are from the booth! We can't say enough good things about this duo and NRG Entertainment! We hired Greg for our NH wedding in September 2017 and he was the best! Greg was extremely professional and flexible in planning prior to the event. He provided us with an online event planner that helped us relay all of our information to him. He made the planning process completely stress-free! The day of the wedding went perfectly! He provided music for our ceremony and reception. Greg went out of his way to make sure the wedding procession flowed seamlessly. He interacted with the guests to make sure everyone was having fun. We got so many compliments on the DJ! Everyone had a blast and people were dancing all night long! I would highly recommend NRG entertainment for your next event! Greg and Jen were recommended to us, and we are so glad we chose them to be a part of our wedding day! Greg knows how to entertain a crowd and it is evident he loves what he does. He really listened to all of my husband and I's requests and did an amazing job. He was easy to work with from start to finish and I would recommend him to anyone! Jen also did a great job with the photo booth, which was a big hit with our guests! We loved working with Greg!!!!! From the moment we met him, we knew we had picked the right DJ! He helped us plan EVERY little detail with the ceremony and reception and was VERY organized and professional! He kept the crowd moving and knew how to "work the crowd" during the formal activities as well. Jen did a wonderful job also with the photo booth and I would HIGHLY recommend getting the photo booth for your wedding! Our guests LOVED it and were in it all night! We had mentioned to him we wanted to do the "Newlywed game" and he recommended instead of using our shoes, to blow up GIANT faces of us on sticks and hold them in the air for each answer! We ran with it and our guests commented to us how awesome that was and they had never seen it done before. We hired Greg at NRG Entertainment for our wedding -- the sound service at our tent reception was perfect! Greg had the flow of the reception down and we couldn't get folks off the dance floor! We didn't micro-manage our playlist, and it worked out great, Greg quickly got a vibe from our crowd and kept the energy up all night. Greg really personalized our wedding and made us feel special. Working with Greg was truly a conversation, not just me telling him what we wanted or him telling us what works. His first priority is you, he makes you feel like you are his only client!! I would email him questions late at night and without fail there would be a response within 24 hrs! Everything Greg did was incredible. He was engaging and knew exactly what music to play and when to play it (Greg had people dancing on the floor all night long!). Finding music that gets both 5 year olds and 80 year olds out on the floor must be so hard but Greg knew exactly what to play. We would recommend him to any and ALL in a heartbeat!! Greg was phenomenal! He kept the the dance floor packed the entire night. He did a great job at playing a variety of music to suit everyone's tastes. We really cannot rave enough about Greg's enthusiasm. Our wedding could not have been more perfect and Greg was a big part of that! Greg was the DJ for our wedding and it was a wonderful experience! He was very detailed and prepared and was involved in our whole planning process. He kept the whole night running smoothly and the energy high. Thanks NRG for a great experience! We got so many compliments on how great our DJ was! People really got on the dance floor and had fun. He was very flexible during the event and responding to sudden changes in the program. Before the wedding, he was very available to answer our questions about the big day, and help us feel confident that everything would go smoothly. We were very satisfied with working with him!